You’ve seen wood-fired ovens whilst enjoying your travels in Europe and you may even enjoy the food theatre that cooking with a wood oven creates in your local pizzeria, but how does a wood fired pizza oven work? Cooking with a wood-fired pizza oven is actually much simpler than you may imagine. All you really need to do is to light a good fire in the centre of the oven and then allow it to heat up both the hearth of the oven and the inner dome. The heat you generate from your fire will be absorbed by the oven and that heat will then be radiated or convected, to allow food to cook. Once you have your oven dome and floor up to temperature, you simply push the fire to one side, using a metal peel, and start to cook, using wood as the heat source, rather than the gas or electricity you may usually rely on. 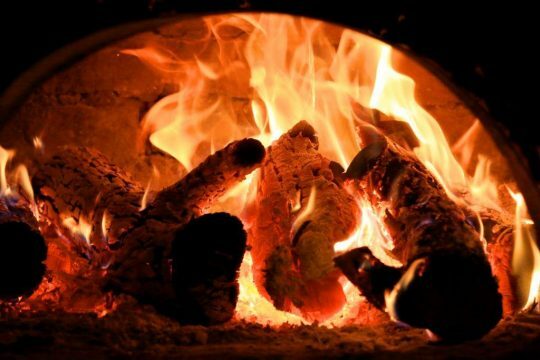 Of course, there are no temperature dials or controls, other than the fire, so the addition of wood is the equivalent of whacking up the temperature dial. If you don’t feed the fire, you allow the temperature to drop. How hot you allow your oven to become really depends on what you wish to cook in your wood-fired oven. For pizza, you need a temperature of around 400-450°C; if you wish to use another cooking technique, such as roasting, you need to do that at a temperature of around 200-300°C. There are different ways to do this. As you are using convected rather than radiated heat for roasting, it is not as important to get the stones as hot. Another way to affect the amount of heat reaching the food in a very hot oven is to use tin foil, to reflect some of the heat away. Heat generated within a wood-fired oven should be well-retained, if your oven is constructed of refractory brick and has good insulation. To cook the perfect pizza, you need to have an even temperature in your oven, both top and bottom. The design of the Valoriani makes this easy, but this is also an area where the quality of the oven will have a big effect. Some ovens may require you to leave embers on the oven floor, to try to heat it up sufficiently. Others have little or no insulation, so you will have to feed the fire much more. But that means it will then have too much direct heat and won’t cook top and bottom evenly. Another thing to watch is, if the floor of the oven isn’t storing heat, you may need to reheat if before cooking every single pizza – a real pain. The message here is to always look for an oven built from the very best refractory materials and designed by artisans, like a Valoriani. So, taking that into account, we’re going to change the title of this blog. The advice above isn’t so much about how wood fired pizza ovens work, but how the best wood-fired ovens work. If you go through a few ovens before steering a course towards a Valoriani, that’s something you’ll come to appreciate.